This web site seeks to provide a time-base measure of the moral behavior of the United States of America. Current Value: +129.3802 lives per thousand people. The following commandments are currently included in the index: 1, 6, 7, 8. 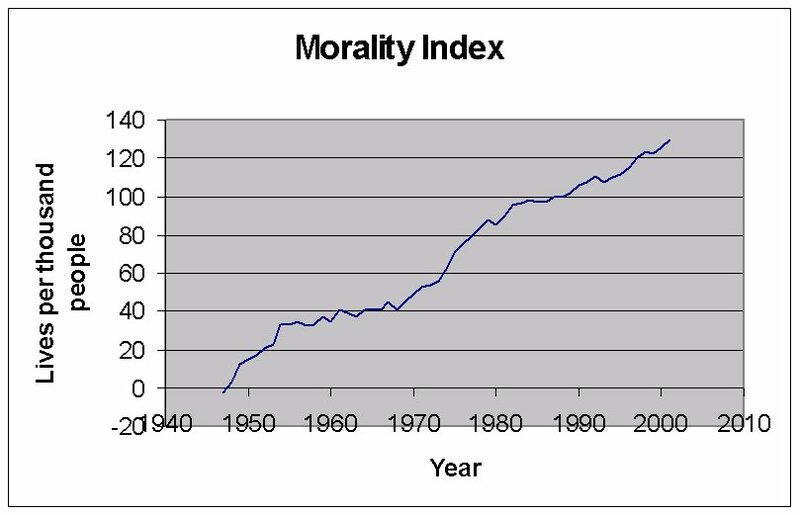 The Morality Index was last updated on March 14, 2004. In the graph above, righteousness is toward the top and evil is toward the bottom. So upward trends are good, and downward trends are bad. Some of the commandments extend farther back than the overall index because we have data farther back for them. Unfortunately, the overall morality index can only extend back as far as the shortest measured commandment. 2. You shall not make any idol, nor bow down and worship them. 4. Observe the Sabbath day by keeping it holy. 5. Honor your father and your mother, so that you may live long in the land. 10. You shall not covet your neighbor's wife. You shall not set your desire on your neighbor's house, nor his land, nor any of his possessions, nor anything else that belongs to your neighbor. Some of these lend themselves to measurement. The Sixth Commandment is homicide. The Eighth Commandment is theft. But if I admire my neighbor's new pool, when have I drifted into coveting it, and thereby violating the Tenth Commandment? Only God can measure morality. Nevertheless, I can measure something related to people's underlying morality, and that something is our moral behavior. I am a Christian, and so I am approaching this problem from a Christian perspective. I have chosen the Ten Commandments as the code of behavior because they are well-known and historically significant. Another important code of behavior is the United States Criminal Code, addressed below in the section on Crime Rate. You are not saved by following the Ten Commandments. "For it is by grace you have been saved, through faith - and this not from yourselves, it is the gift of God - not by works, so that no one can boast." (Ephesians 2:8-9) "So it is that we are saved by faith in Christ and not by the good things we do." (Romans 3:28) We are made righteous by the blood of Jesus Christ shed for us. According to standard Christian theology, you will go to heaven if you put your faith in Jesus Christ. Romans 10:9-10 states: "For if you confess with your mouth that Jesus is Lord and believe in your heart that God raised him from the dead, you will be saved. For it is with your heart that you believe and are justified, and it is with your mouth that you confess and are saved." The Letter of James states famously in 2:26, "As the body without the spirit is dead, so faith without deeds is dead." We obey the Ten Commandments out of thankfulness for our salvation, and to put our faith into action. The danger in publishing a morality index is that people will concentrate too much on the Law, on following the letter of the Ten Commandments without any joy in doing the right thing. Legalism is no substitute for morality. When asked to choose the greatest commandment, Jesus replies in Matthew 22:37-40 "'Love the Lord your God with all your heart and with all your soul and with all your mind.' This is the first and greatest commandment. And the second is like it 'Love your neighbor as yourself.' All the Law and the Prophets hang on these two commandments." Jesus fulfills the Ten Commandments by emphasizing what God really wants from us. God gave us the Ten Commandments for a purpose, and part of that purpose is focus our minds on what we really need from God: grace and mercy. "So the Law was put in charge to lead us to Christ that we might be justified by faith." (Galatians 3:24) By providing a morality index I hope to turn people's hearts toward our relationship with God, and the pathway to salvation through Jesus Christ. That page describes the circumstances that led me to formulate a morality index and publish it on the Internet. It also keeps track of notable events in the history of the Index, including any revisions to the methodology or calculations. That page lists the United States crime rates for various offenses, as reported by the Federal Bureau of Investigation. Crime is not equivalent to morality per se, but it's definitely related. Computing the current Morality Index requires making adjustments based on population, monetary inflation, and other quantities. That page contains tables of supporting data used in the computations. Statistics of Income Division, Internal Revenue Service. Programs Support Section, Criminal Justice Information Services Division, U.S. Federal Bureau of Investigation. Everyone who collects data and records it carefully. (This section describes a book by Carl Drews.) The biblical book of Exodus relates the deliverance of Moses and the Israelites from slavery in Egypt. In October 2014 I published a book about the Exodus, focusing on the account of crossing the Red Sea in Exodus 14. The full title of my book is: Between Migdol and the Sea: Crossing the Red Sea with Faith and Science. The book presents scientific and literary evidence that the Hebrew Exodus from Egypt was an actual historical event that occurred in 1250 BC. The Israelites escaped from Pharaoh's army through the yam suf in the eastern Nile delta. Chapter 7 Following the Trail analyzes several candidates for the biblical Mt. Sinai. To leave moralityindex.com and learn more, please visit migdolbook.com.